As the first business employee at Lucid, I have personally answered thousands of support inquiries over the last five years. From that experience, I’ve learned that support tickets come in every shape and size—from the very simplistic “how do I do X?” product questions to a complex partnership proposal. Another key learning? If many of your best sales leads are not coming from your support channel, you’re doing it wrong. I realized this lesson at Lucid even in the very early days in 2010 when I was answering every support ticket out of a Gmail account. Back then, my process was pretty sophisticated. As support tickets came in, I would quickly triage them. Where I sensed purchase intent from the user, I would add a Gmail label called “Follow-up: Sales” after my initial response. Every Monday morning, I would follow up with all of these users until they (1) purchased; (2) responded with no interest; or (3) never responded after three attempts. Any sales guru could list off any number of things lacking in this process. Nonetheless, I helped close a number of deals -- including two customers that remain among our largest today -- almost entirely with this process. Clearly, engaging with customers about sales opportunities via a support channel had potential. After scaling this same process across multiple support agents (via a legitimate support ticketing platform, Zendesk), the flaws became even more apparent. Most significantly, the priorities and processes of an efficient support agent are very different than that of a successful sales representative. Despite 8 million users between Lucidchart and Lucidpress, our support team is still relatively small. In fact, we average ~1 agent per million users! While intuitive and high-quality products are essential to make that ratio work, so too is the efficiency of our support team. A support agent’s priority then is to provide support as efficiently as possible -- usually by providing an answer that thoroughly addresses the original question in such a way that the user doesn’t even have to respond. For a sales rep, however, the goal is different. Sales typically requires multiple interactions, particularly when there are multiple people involved for a larger purchase. It requires follow-up after follow-up to help move the deal along -- and relationship building is critical. So, while support may focus on minimizing the number of interactions while providing world-class support, a sales agent is often looking for more opportunities to engage motivated buyers. First, recognize that change management is hard and that this likely won’t be a trivial effort. According to Harvard Business Review, 70% of all change initiatives fail. One of the major reasons for failure tends to be poor communication from the beginning and between all involved. For example, a recent study found that 68% of senior managers said they’re “getting the message” about reasons for major organizational changes, but that figure falls to 53% for middle managers and 40% for front-line supervisors. After all, process optimization is rarely about boxes and arrows. It’s about people. Take the time to clearly articulate the reasons for change and the corresponding goals, and look for consistent opportunities to reinforce that to everyone involved. In our case, I met first with the leadership of our support organization and then with the entire team. I revisited our company’s growth and revenue goals, showed a few specific examples of sales opportunities we were currently missing in our support channel, and asked them if they would be willing to adapt their processes to help reach our company goals. They quickly grasped the vision and the importance, and they were committed. Two members of our sales operations team manually went through several hundred recent support inquiries and began to organize them into buckets. While we had some general hypotheses, we didn’t know the perfect categorizations/buckets before we started. As they spotted a new pattern, they would create a new category. After a first pass, they had dozens of categories, many of them with only one or two examples. Consequently, they collapsed similar categories to create a manageable number. Did the user ask for a trial extension? Clearly this demonstrates interest in fully exploring the product and an opportunity for a sales rep to engage. Did the user mention a competitor? This often denotes a “bake-off” or comparison situation where having a sales rep engage can make the difference by helping the potential customer understand the benefits of Lucidchart. Did the user mention an integration? For Lucidchart, our integrations like Google Apps, Confluence, Jira, and others are premium Team / Enterprise features and an opportunity for a sales rep to engage a more qualified prospect. Is the user requesting an admin change? People are switching jobs now as much as ever — if the administrator is changing on an account, it is an opportunity to ensure that we have a new champion in place at the company and if appropriate, to discuss potential expansion opportunities. In total, we had seven different categories, including more subtle ones that are undoubtedly unique to our business and that only you can define for yours. But the categorization is only the first step of the process definition! Take a look at the examples above. Each of those situations are quite different and merit a different response from the support agent, potentially different actions (e.g., extending the trial) or follow-ups, and different responses from the sales rep to whom the lead is passed. Don’t gloss over this step -- treating every lead the same is an easy mistake to make! 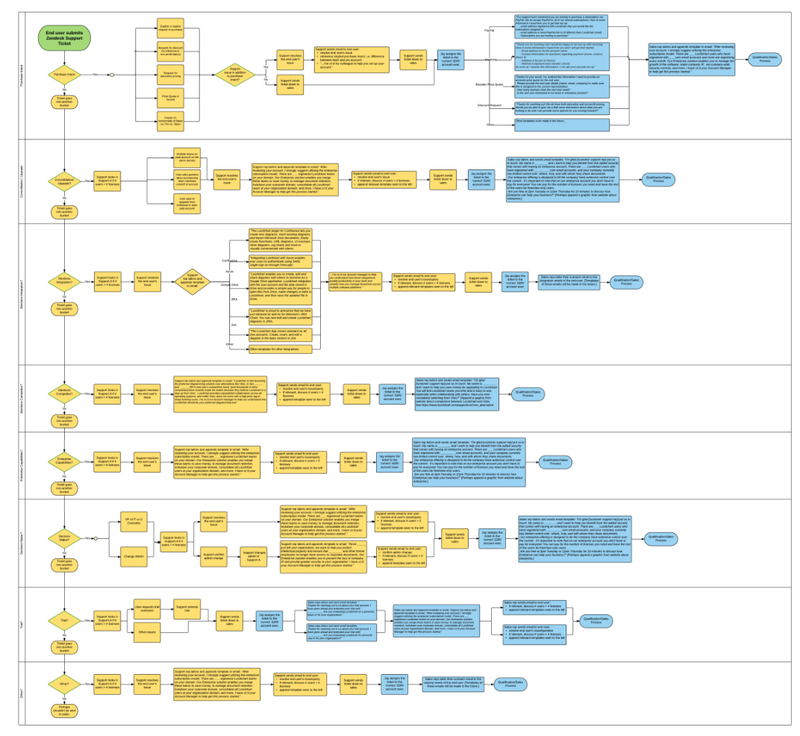 As a result, we mapped out the full process in Lucidchart that showed who says what and who takes which actions to successfully transition a ticket from a support inquiry to a qualified lead. After I worked personally with the sales ops team to review and collaborate on the process, we then shared the Lucidchart document with ‘comment’ permissions to the support team and the sales development team, allowing them to give feedback. What were we missing? Were there concerns about the new process? After several iterations, we finalized the process and met in person to go through it in detail. Pro tip: we used Presentation Mode in Lucidchart to keep the focus of the room, as it allowed us to zoom in on only the part of the process that we were discussing at that moment and not let the audience’s focus wander to other parts that would be discussed later we weren’t ready to discuss yet. We left the presentation with unanimous support of the new process! I still read every support ticket (yes, thousands of them each month). What can I say? Old habits die hard. As COO, I find there are few better ways to keep a pulse on the business. And as we implemented this new process, I found this habit to be advantageous and instituted a daily, weekly and monthly process to ensure learning and compliance with the new system. Daily: Specifically, we use Zendesk, and I have each support ticket forwarded to my email. Each day, I would spend 15-20 minutes quickly skimming these emails and marking those tickets where the customer seemed to have expressed sales intent (often as part of a larger support inquiry). Because many of these tickets required several touches to resolve the original question, it could take several days before the support agent would close the ticket or pass it to sales to engage. Weekly: As a result, I set aside a time each week to revisit the tickets I had previously marked with sales intent. I was pleased to see that the process was working and the majority of these were being passed to sales. However, I would often spot some opportunities falling through the cracks and simply being closed completely. I would typically leave a simple note to coach the support agent to help them identify the same sales intent I was seeing. Monthly: On a monthly basis, I would compile the list of tickets where coaching had been required. At this macro level, it was easy to identify the common patterns, and we would then review these patterns with specific examples in a support team meeting. The team quickly grasped the gaps and made tremendous improvements each month to catch the ever-subtle indicators of sales interest. This consistent feedback enabled us to reach near-perfect compliance in a matter of weeks. 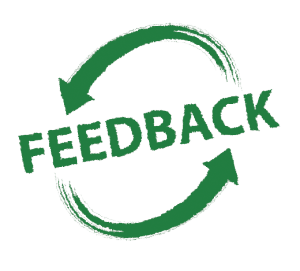 Every great process has a strong feedback loop. In this case, our sales operations team worked to compile a simple report that outlined (1) how many leads were passed; (2) how many were qualified; and (3) how much ARR (annual recurring revenue) was closed from these qualified leads. In addition, the report included specific examples of large deals / logos tracing back to seemingly simple support inquiries. As someone who has personally answered thousands of support inquiries and read many more, I can confidently say that Lucid places tremendous value on the efforts of our support team. After all, they are often the face of the company to our customers and ensure that we deliver an all-around excellent experience. Nevertheless, it is often challenging -- even for great companies -- to establish a tangible link between top-notch support and financial goals. This process -- and the corresponding feedback loop -- helped articulate at least a small portion of that value by quantifying the revenue impact from passed sales leads. Having this clear, specific link to the company’s growth and revenue targets has been incredibly motivating for the team. So, there you have it. Are you sitting on a potential gold mine of sales leads from your support channel? Use Lucidchart with your team today to map out the process, build consensus and generate leads!